Options in hard surfaces like tile and stone are continually expanding and evolving, giving homeowners more choices to make than ever. Whether you want hard surfaces with a subtle, soft appeal or a stony, rustic intensity, you can just about achieve any look these days. Advances in technology have opened new avenues for printing, cutting, arranging and applying tile and stone. As the industry rapidly evolves, we’re keeping ahead of the game by checking in with local experts on which trends are gradually appearing and which are on their way out. When it comes to tile, homeowners are becoming less and less afraid of introducing colors and patterns. While the clean look of whites and light grays still has a hold on many a bathroom remodel, more people are growing bored of the prevalent trend. “Everyone is getting much braver,” says Lindsay Swenson, chief executive merchant at Floor & Decor Design Gallery. 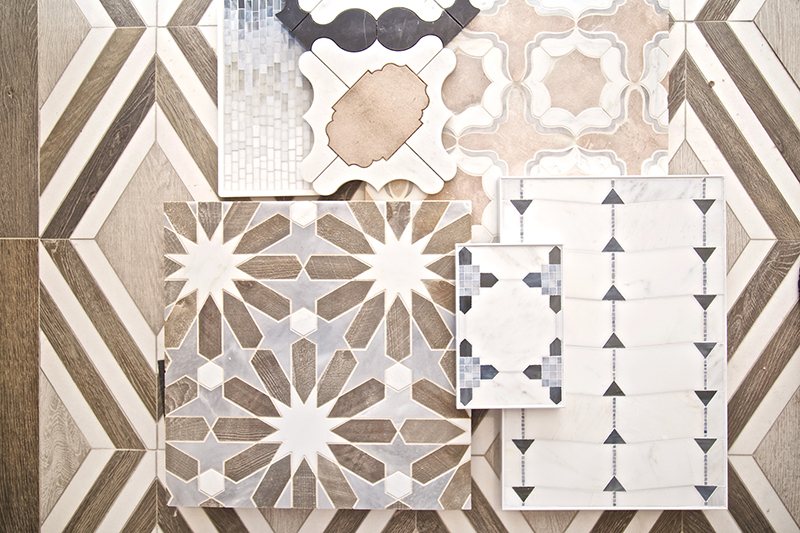 Swenson sees customers being more brave with boldly patterned marble and stone tiles that can steal the show. Many homeowners fear they will grow tired of bold choices and that they will be viewed as “trendy” down the road, but even nonbold choices can be seen as trendy, too. Swenson likes to suggest the kitchen backsplash as a place for boldness, as it generally requires a small amount of tile and is fairly easy to change out over time. “Frankly, whatever you pick, you may be sick of looking at it 10 or 15 years down the road, so why not get something you love now?” she says. Grout choices present another playing field for boldness through higher contrasts. According to Swenson, changing the grout color can turn something boring and sterile into a something with depth and visual texture. The printing technology of porcelain tile continues to improve, which gives homeowners opportunities to introduce the look and texture of other surfaces such as stone or wood while saving on money and maintenance. “The variety of looks is endless,” she says. With offerings like distressed white wood planks to a textured, dark slate, it’s easier now than ever to fool guests with your porcelain tile. At Stafford Tile, owner Peggy Stafford is seeing wood-look porcelain tile in combination with stone in a variety of mosaics. Not only does it lower the cost of the mosaic, but it gives a glamorous look that can be used in different areas, floor or wall, thanks to its porcelain qualities. Of course, there are mosaics now incorporating actual wood as well, in addition to glass, metals and other materials. According to Stafford, advanced technologies now make it possible to mix and meld different materials that were historically problematic to combine due to differences in thickness. As to trends, Stafford notes that the design industry is helping drive the tile and stone industry at a rapid speed. Never before has she seen the tile and stone industry so quickly pick up on the color predictions for the Pantone Color of the Year. Tile and stone manufacturers are paying attention and immediately beginning to design and produce around these annual color trends. In 2017, when green was the color of the year, mosaics began quickly hitting the market with highlights of that color. Stafford credits the improved technologies in manufacturing such as laser cutting and photographic reproduction that allow for such quick design-to-market turnarounds. At Mason Ros architecture firm, Principal Kristen Mason Klamer is noticing changes in approaches to grout. According to Klamer, grout has traditionally been an afterthought, a color chosen after the tile is selected to pull a certain color tone from the tile. On occasion, the firm now incorporates metals in grout joints for added pizazz. The inset brass gives the appearance of dividing the stone planks or tiles, adding elegance to the installation with the perception of gold-capped tiles. Klamer also offers a tip for avoiding buyer’s remorse with regard to handmade or non-rectified tiles (tiles where the edges are inconsistent or uneven). Because these tiles require larger grout joints to allow for the tile’s inconsistencies, grout plays a larger role. Klamer warns against dark grout in this type of installation, as the large, dark lines can steal the attention from the beautiful textures of the tile itself. As to industry technological breakthroughs, Mason Ros Principal Jennifer DaRos notes NeoLith Countertops. “It is part of the new generation of super high-density ceramics called ‘sintered stone,’ and can be used as an unstainable, extremely durable solid surface material,” saysDaRos. “We like the new trend of ultra-thin and knife-edge countertops, and this product is tough enough to self-support an overhang with only a 12-millimeter thickness.” She adds that the material is light enough to be used as drawer and cabinet door overlays for a very dramatic look. Additionally, lightweight composite stone panels allow the firm to go beyond large format tile and install full floor-to-ceiling stone without grout division. 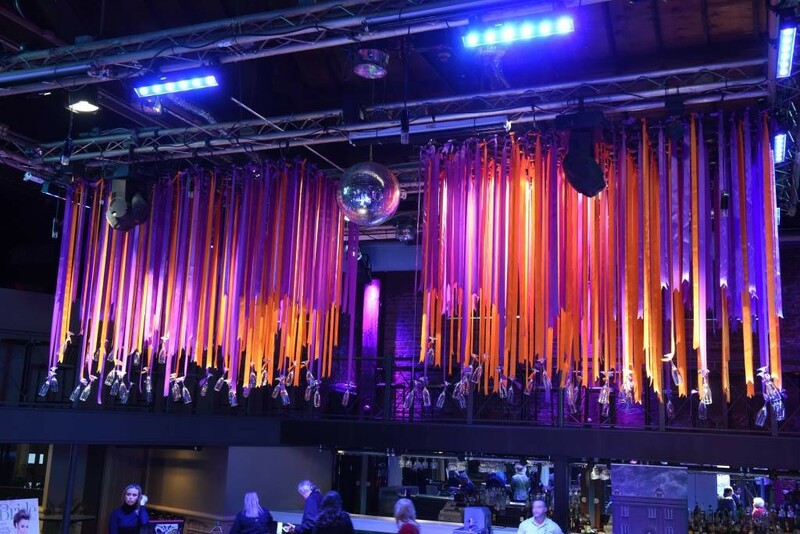 “Translucent composite stone panels — 6-millimeter natural stone slabs affixed to glass or polycarbonate backers —allow for glowing stone panel effects for both ambient and impact lighting in all sorts of interesting installation options,” adds DaRos. Natural stone is as popular as ever, and while mottled granite is a waning trend, slabs of granite, marble and quartz continue to be popular as technologies allow for new looks, textures, and installations. Like our tile experts, Hicks also notices a trend away from whites and a return of color, specifically in earth tones like creams, browns and gold. Hicks notes that technological advances have made it possible to quarry larger blocks of stone than ever before, allowing for larger slabs. As homeowners seek expansive kitchen islands and other vast surfaces coverings, these large slabs are more popular than ever. At Select Stone, Assistant Manager Allison Marzahl is also noting the earth tone comeback in slab purchases. Additionally, she says, stone trends seem to be moving in the way of new finishes. Select Stone keeps a large selection of leather- and honed-finish stones in addition to the traditional polished stone. At Flynn Designs, a full-service design firm, Kristine Flynn, owner, also sees a rise in quartzite, especially for those seeking the white marble look but with added durability. According to Flynn, the digital technology offered by Slabsmith that allows a customer to see digital reproductions of their chosen slab has been a game changer for her clients. Whether you’re looking to employ or avoid various trends in tile and stone, or you’re merely looking for what suits your personal taste, there’s one important thing to keep in mind with these products. In order to avoid buyer’s remorse, every one of our experts had one recommendation: educate yourself. From the varying porousness of certain stones to what size grout joints your tile requires, one overlooked detail or rushed decision can result in an installation you don’t love. Don’t be afraid to seek a professional’s expertise, and ask every question you can think of. It’s hard for homeowners to keep up with the possibilities in an industry so rapidly evolving. After all, that’s why you have experts.